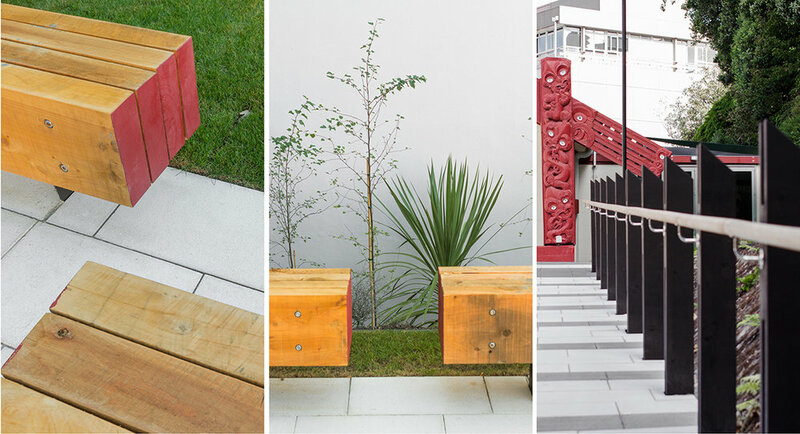 The Tenths Trust commissioned us to revitalise the atea of Pipitea Marae in central Wellington. The space provides for a wide range of uses including formal powhiri and hui, a safe place for children to play and a rare greenspace for surrounding residents in urban Thorndon. A basket weave paving pattern is used to suggest the meeting and entwining of two parties and provide gentle, ramped access from street level to the atea above. The existing overscaled retaining wall was partially removed and replaced with a curving, ponga log clad embankment to entice visitors into the atea. Two large lawns are created either side to accommodate larger functions, one of which slopes to form an amphitheatre for the atea. The project won a national award for outstanding design and was nominated for the Te Karanga o te Tui award in the 2015 New Zealand Institute of Landscape Architects awards. It also received an award for innovative public space in the Wellington Civic Trust Awards in 2013, has been featured twice in New Zealand's journal of Landscape Architecture and once in Architecture Now.